It’s Foodie Friday and Dishing in Kitchen published an awesome recipe today for a knockout summer appy or lunchtime main that’s simple to make, beautiful look at and super-tasty. It’s the kind of food I love to eat, make and serve. 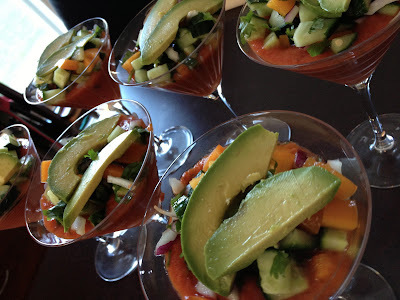 Get your gazpacho on. Om. The kitchen is where I find my zen. As multipreneurs, it is easy to become overwhelmed, taking multitasking to new levels as we not only manage multiple activities, but also manage diverse concepts, business streams and passions. No doubt we are forging new neurological pathways, firing synapses and building mental muscle. These calisthenics also fill our bulging heads to bursting (yes, that is the sound of your head exploding). Breathe. Find your zen. In all the many activities and projects you initiate, find the one that forces (or allows) you to focus completely on it. And only it. Cooking is that place for me. Because it involves heat, often fire ( I do have a gas range), things that can explode, scorch, or freeze and a multitude of sharp and pointy knives and utensils, cookery demands my full and undivided attention. I get in the zone. I find my zen, and it’s my happy place, too. Of course, there is also the eating. Bonus. I am not a book reader. I can't tell you how many books I've picked up, started to read and never finish. Yet, oddly enough, I believe I find my zen when I read. I guess it just depends on how interested I am in what I read. I love reading blog posts, and some books have managed to get on my "finished reading" list. Ah, yes. The book. Home of all things possible and a way to be alone and not-alone. One of my mom's favourite sayings "Books. Our silent friends"